Yann and I debated for a long time whether or not we would spend our last month in China relaxing, or keep up to our usual fast pace. I had a list of over a dozen places scattered over the country that I still wanted to visit, Yann was pulling for the relax option, wanting to stay in one place for a few weeks to rest. This despite the fact that for over a whole year on the road, Yann has found it quasi-impossible to "do nothing" as he calls it. We compromised with our short trip to Fujian Province, then onto Yangshuo, a backpacker getaway in the southwest. Whether we liked the place or not, we knew we could get cheap accommodations and the weather would be good. After one day in Yangshuo, Yann was ready to leave, and so was I. We had spent out first day in town wandering around taking in the hundreds of souvenir shops (many with visa card stickers in their windows, a very bad sign) or sifting through menus trying to see who sold the cheapest pizza or hamburger. In the evening we had the privilege of watching three rowdy foreigners sexually harassing/assaulting local Chinese girls. All of this on or around West Street, the pedestrianised centre of nightlife and tourist activity in Yangshuo. Our hotel was on a side street directly behind the Moulin Rouge Nightclub, and the bass shook our room until about two in the morning. The karst scenery that makes the region famous was marred by haze. Despite all this, we forged on with our relaxing. Actually our Chinese visa was two days from expiration and we had to renew it at the local police station, a process which takes a week. On the plus side, the staff at our hotel were extremely friendly, we found a restaurant selling great tuna burgers (for cheap), we rented a DVD player for 0.75$/night and we met the the town's two bootleg DVD salesmen. We got used to the loud music at night and gave in pretty quickly to the seduction of foreign comforts. Despite rock-climbing, kayaking, musicals, cormorant fishing, cruises down the Li River, hot-air balloon rides, cave exploration, hot spring tours... we spent most of our eight days in Yangshuo doing nothing. We managed to move for a half day cooking course which ended up being worth the effort. The course included a tour of the local market, Southern Chinese are reknowned throughout the country for their 'diversified' menu. As a Chinese saying describes their cuisine: "Anything that walks, swims, crawls or flies with its back to heaven is edible". 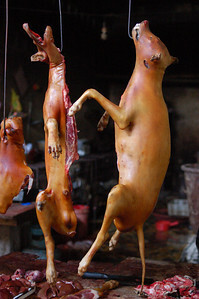 We fell victim to the wrath of the dog meat seller, who threatened to pelt us with a piece of raw dog meat if we didn't stop taking pictures (maybe she's had a few too many hypocritical foreigners being "outraged by the cruelty"). 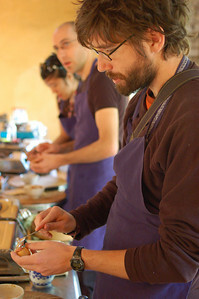 The course itself was held in a lovely renovated farm house in a small village outside Yangshuo. We now know how to cook (sort of): beer fish (a local dish of fish cooked in beer, chicken with cashew nuts, stuffed mushrooms, Hongshao eggplant and vegetables with garlic. 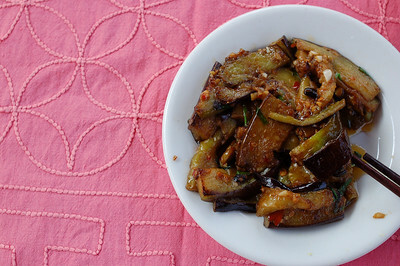 Cooking Chinese dishes was way more difficult than cooking Cambodian dishes, mainly because everything is done so fast. We had the woks blasting at high heat for most of the course with the instructor yelling out instructions and assistants helping us as we lagged behind. Yann proved much more skilled than I was. 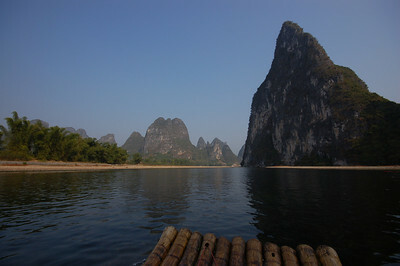 Later in the week we did the mandatory cruise down the Li River. 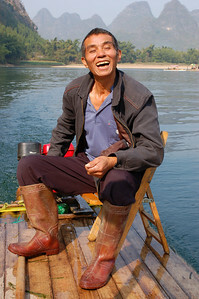 Actually we hired a (motorised) bamboo raft for a half hour ride. Only a few years ago, villagers still paddled people around. Now most rafts are no longer made out of bamboo, but out of PVC tubes and all of them have motors, progress. One afternoon, Debbie, the receptionist at our hotel invited us to her village, a short bike ride away. Despite working full time at the hotel, in between shifts, she rides her bike to her father's farm where she helps him in the fields. 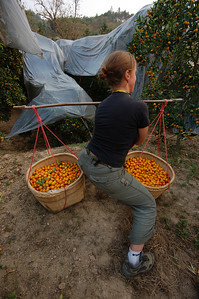 We joined her and her father, picking miniature oranges. At the end of three hours we had picked, along with her father, two large baskets, which her father will then bring to the market to sell on his motorbike in the early morning. Yann and I could barely lift the baskets off the ground (actually Yann got it up on try number three, and I never got it off the ground), Debbie picked them up without a sign of difficulty her father seemed highly entertained by our display of inferiority. It made us appreciate the little old ladies lugging around the same size baskets full of pomelos through the streets of Yangshuo. Despite the rave reviews, we could have passed on West Street and Yangshuo tourism in general. The flower crown sellers, the cormorant fishermen who have abandoned fishing for the more lucrative practice of posing for photos dressed in full fishing gear (with cormorants), the constant harassment by postcard sellers (you can't sit down for two minutes at a restaurant before they find you), the pashmina vendors, the 'Tibetan silver' stalls and the always popular Han Chinese dressed up as local minorities. It's not that this stuff doesn't exist all over China, it's actually quite manageable, in small doses. I'm still vaguely lurking on your blog and vicariously travelling around Asia.